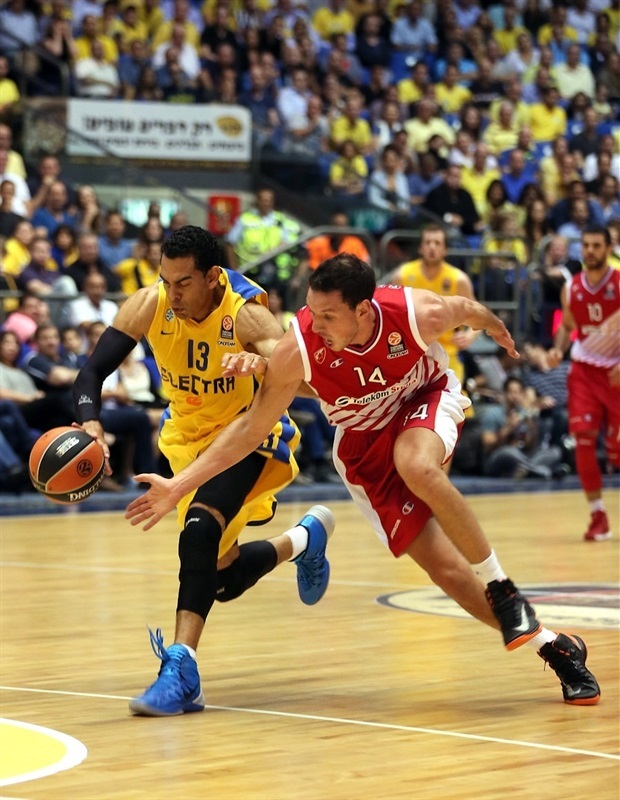 Maccabi Electra Tel Aviv won its Euroleague home opener for the 15th year in a row and tied a club record in beating Crvena Zvezda Telekom Belgrade 96-82 at Nokia Arena. The winners improved to 1-1 in Group D, while keeping Zvezda winless. Maccabi made 15 three-pointers, matching the team record for most in a single game done twice before. 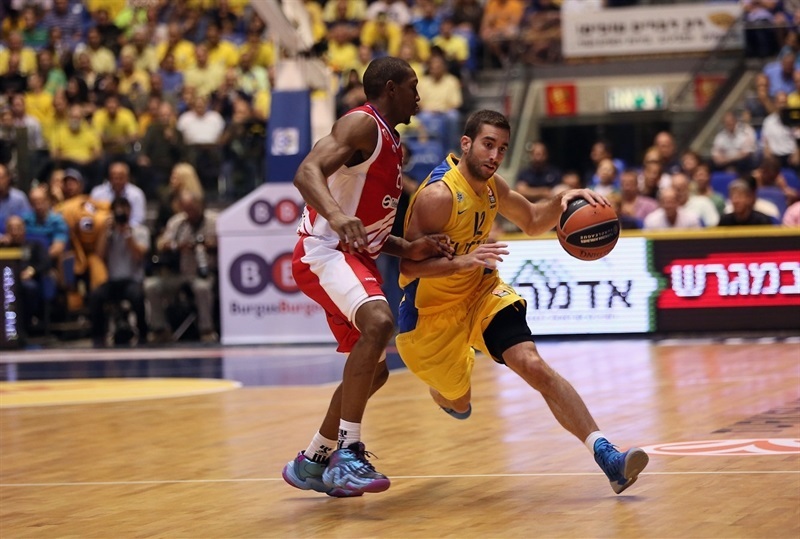 Devin Smith made three of them as he led seven Maccabi scorers in double figures with 17 points. Joe Ingles scored 16, centers Sofoklis Schortsanitis and Shawn James netted 13 each, David Blu added 11 and Yogev Ohayon and Ricky Hickman had 10 each. For the visitors, Boban Marjanovic stood out with 20 points and 13 rebounds, Jaka Blazic scored 17, Charles Jenkins added 11 points and DeMarcus Nelson and Ivan Radenovic finished with 10 points apiece. Before the game, Maccabi inducted Lou Silver and the late Jim Boatwright into the club’s hall of fame. Silver and Boatwright’s widow Chris were joined by teammates from Maccabi’s 1977 Euroleague-winning side as Sliver’s No. 12 jersey and Boatwright’s No. 15 were raised to the rafters. 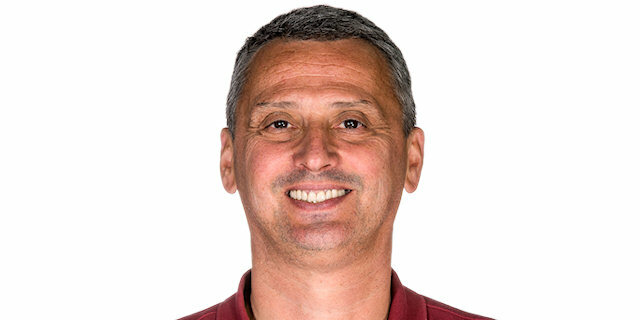 Maccabi also welcomed Zvezda assistant coach Velibor Radovic, who played for Maccabi and two other Israeli clubs in the late 1990s and early 2000s. After both teams came up empty on their opening possessions, Blazic broke the ice for the visitors with a pair of free throws. Maccabi stepped up on defense and got back-to-back threes at the other end from Ohayon and Ingles. Blazic remained hot for Zvezda and soon tied the game at 6-6. Ohayon’s reverse layup and a finger roll by Ingles put the hosts back in control, 11-6, midway through the opening quarter. 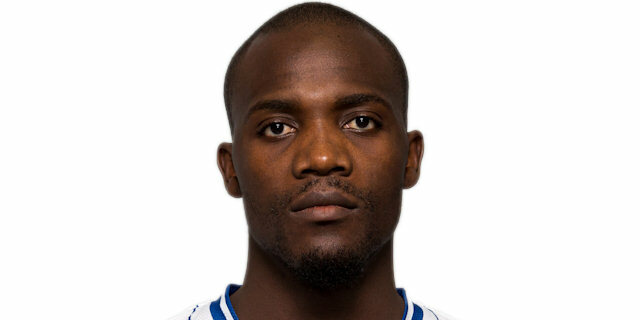 Schortsanitis came in as the game’s first substitution. 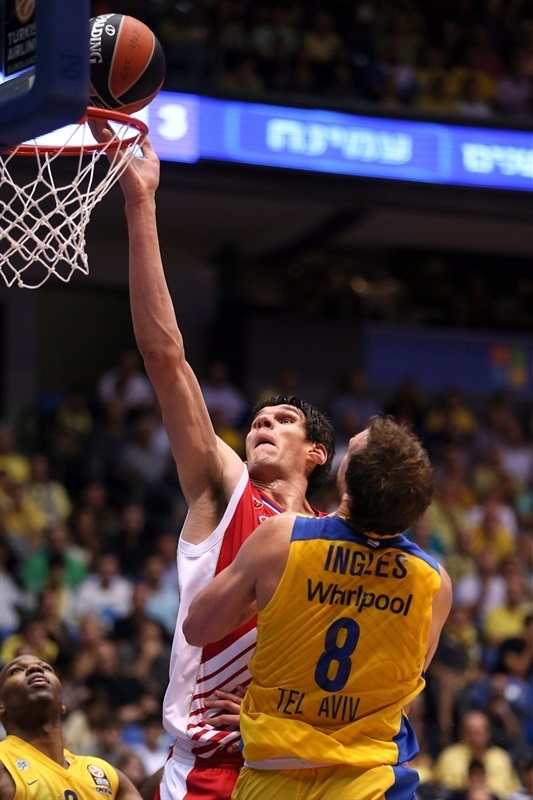 Marjanovic scored a tip in at one end, but fouled Big Sofo as the Maccabi center scored at the other. Marjanovic soon took a seat with a second foul as Schortsanitis free throws put the hosts up 16-10. Branko Lazic came in and scored in the offensive glass with his first touch. A David Blu triple further extended the margin to 21-12. Radenovic got 2 back for the visitors from the line to make it 21-14 at the end of the quarter. Jenkins and Nelson tried to ignite the visitors, but Blu separated their baskets with a triple to keep the hosts comfortable. Rasko Katic was called for an unsportsmanlike foul for stopping Schortsanitis in the paint. He made a free throw and Smith scored on the resulting possession to make it a 9-point game again. Jenkins answered quickly, but an Ingles three made it 30-20. Smith bettered Nelson’s next basket with a triple as the hosts looked to pull away. After a timeout, Marjanovic dunked and the Zvezda defense frustrated Maccabi leading to a Blazic open-court dunk. Hickman and Marjanovic traded scores. Marjanovic remained a force with a blocked shot, a trip to the line – though he missed twice – and another offensive rebound and score to close the gap to 35-30. Jenkins stripped Ohayon and darted in for a slam. Blu showed his savvy with a nifty layup and Schortsanitis displayed a nifty hook shot before Ohayon finished a nice Maccabi run with a layup. 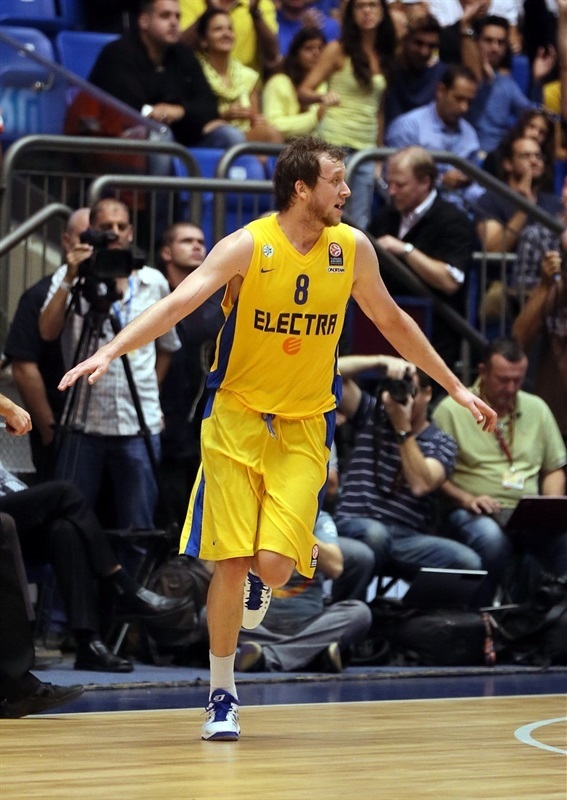 Ingles assisted Hickman on the break as Maccabi finished the half on an 8-0 run to lead 43-32 at the break. Marjanovic continued to dominate with a slam and a block early in the second half. James challenged Marjanovic with a score at the rim and then an uncontested three-pointer. Ingles hit a step-back three as the hosts’ lead rose to 51-34 and Zvezda called timeout. Blake Schilb scored his first points for the visitors. Ohayon found a cutting James, who extended the gap to 19. Marjanovic overpowered Ingles for a slam, but James matched him. A pair of threes from the left elbow by Marko Simonovic and later another follow basket by Marjanovic brought Zvezda within 59-46. Ohayon and Hickman sandwiched threes around another from Blazic to keep the hosts far ahead. Ohayon limped off and got his ankle taped. Radenovic scored a put back and Katic added free throws, but Tyrese Rice sank a three at the buzzer to make it 73-56. Big Sofo delighted the crowd with a steal early in the quarter. Smith took the lead past the 20-point mark with a three-pointer. 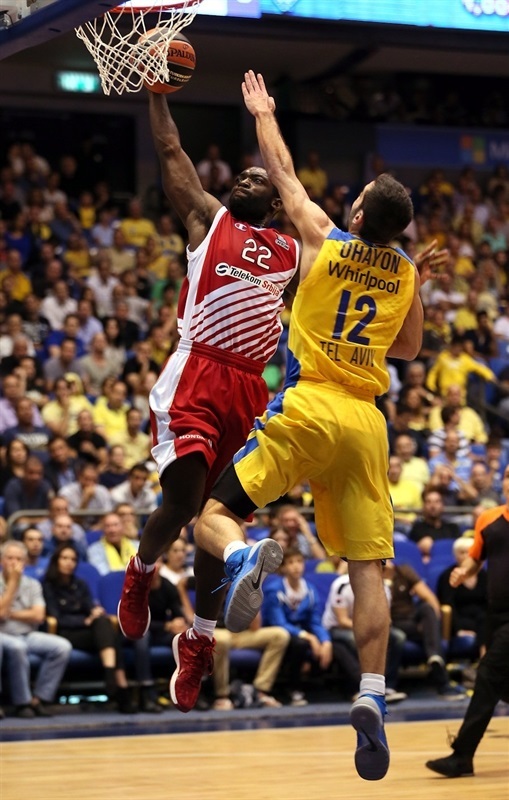 After Lazic scored from the line for the visitors, Schortsanitis scored over Marjanovic to make it 79-58. And then Smith nailed his third three of the night. Schortsanitis took a bow as he left the floor with 5 fouls. Marjanovic finished another play with an offensive rebound and stuff. 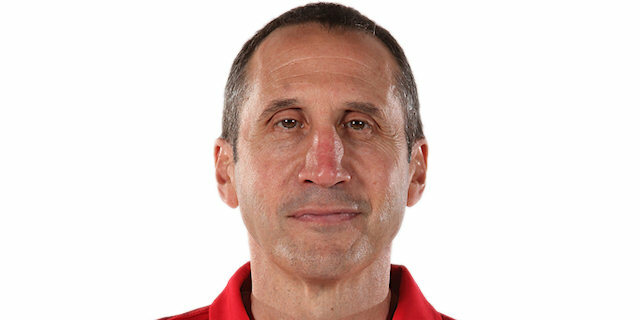 A Guy Pnini turnover led to a Belgrade fast break and a Blazic slam, which prompted Maccabi coach David Blatt to call timeout. 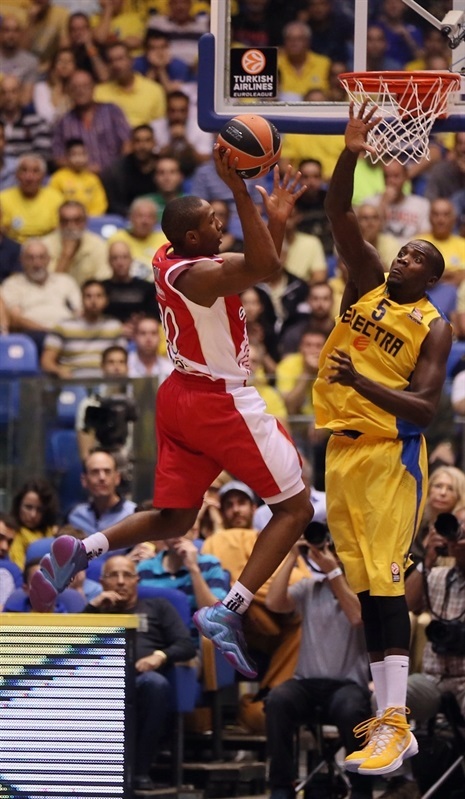 Nelson made it a 20-point game before James ended Maccabi’s brief slump with a layup. The Zvezda bigs continued to chip away at the lead while also sending James out with 5 fouls. A Radenovic three-point play on the offensive glass made it 86-68 with four minutes remaining. Blazic drove for a basket and then Nelson closed the gap to 14. 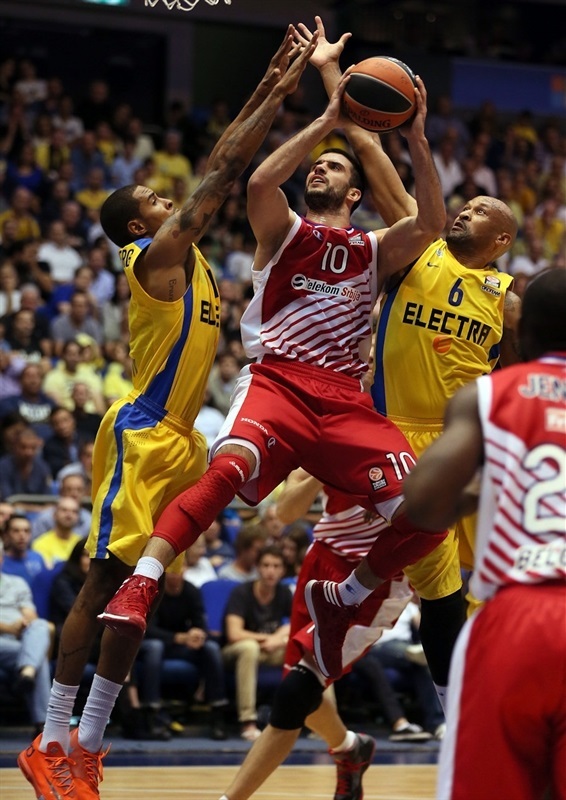 Radenovic made it 10 straight Zvezda points before Rice came through with a three-plus-foul to rescue the hosts. However Jenkins connected from downtown at the other end. Ingles free throws helped boost the hosts to 91-78 with 1:12 to go. And a Hickman layup in the final minute essentially wrapped up the win. "A very well-played game on our part and a very good show for our fans against a team that is much better than the score showed tonight. They are a team we respect, with a great tradition. It's good to have them back in the Euroleague." 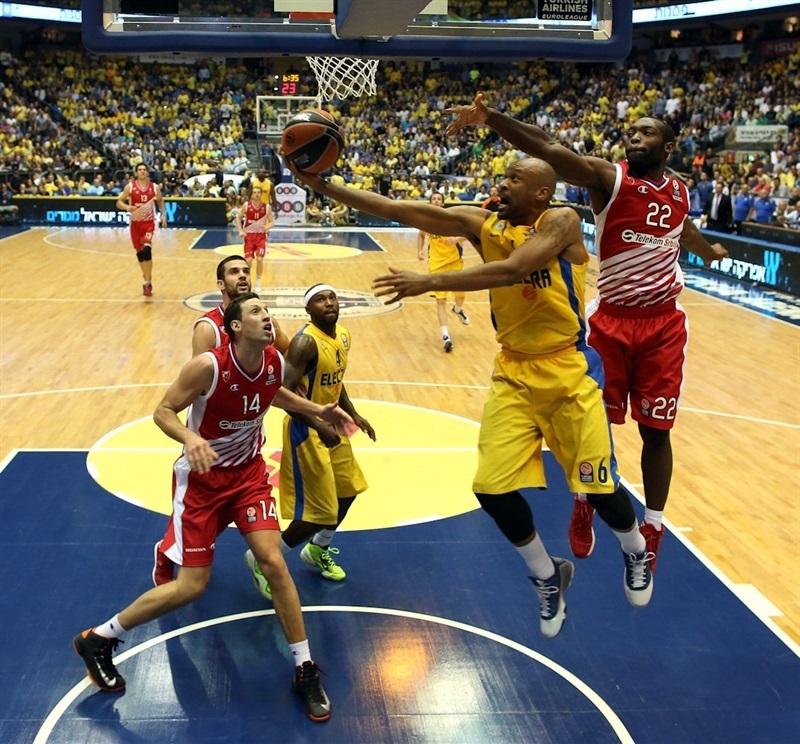 "We congratulate Maccabi on their great game. We played well in the first minutes, but they shot well from three-point range from the beginning, and they completely deserved to win. We gave them a lot of opportunity to have a good game from the outside. We only succeeded in cutting the point difference as much as we could." "This hasn't been an easy week, and we just wanted to turn things around. We came out and played positive basketball, and we got the win."